NOTE: This article has been updated below to note the 2019 champions and evaluate how we did in our preview sections with updated photos from Saturday with links to races and interviews. There was an interesting exchange on social media at the end of the last track season in response to a poll about adding events to the standard CIF schedule. There was considerable sentiment to add a distance event to balance out the difference between sprints and distances at the State Meet. Two of the running events most widely noted were the 4x800 Relay and Distance Medley Relay (1200-400-800-1600). 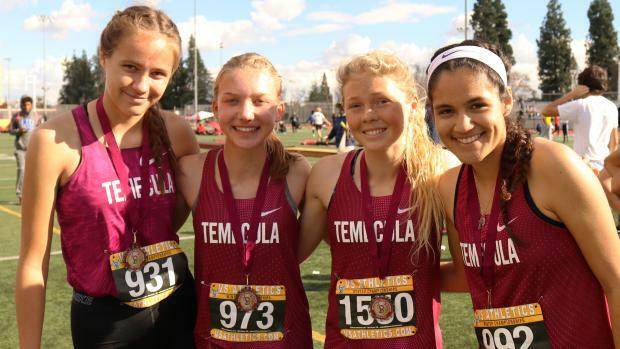 We do see those events quite frequently in the spring at invitationals and relay-only meets but they fall off the schedule once the CIF post-season gets underway. Our first opportunity to enjoy and appreciate the off-schedule relays is the CA Winter Championships. This funky indoor-distances-outdoors meet showcases the 4x8 and DMR distance-friendly relays as well as the sprint-friendly baton-passers, the 4x200 and Sprint Medley Relay (100-100-200-400). On the following pages, find a preview look at those relays in advance of Saturday's CA Winter Championships at Arcadia HS. Note: Top marks from 2018 are included if they weren't also achieved at the Winter Championships.